Title cut away. 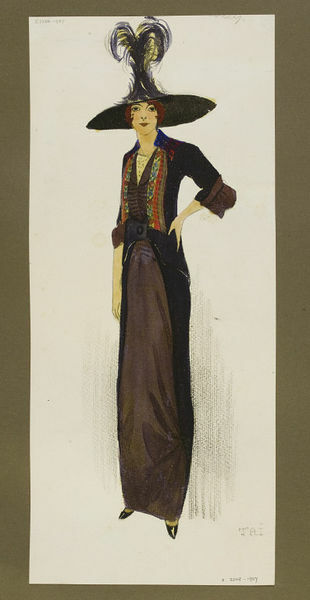 Dark chocolate brown day dress with black redingote with rust, blue and cream embroidered bands, black wide-brimmed hat with upstanding feathers around crown. Shown on a dark-skinned model. Jeanne Paquin, Été 1912. Title cut away. 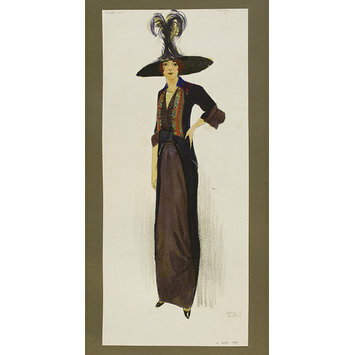 Dark chocolate brown day dress with black redingote with rust, blue and cream embroidered bands, black wide-brimmed hat with upstanding feathers around crown. Shown on a dark-skinned model. 1 of 60 fashion designs for Summer, 1912.